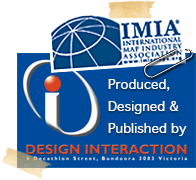 The term 'Design Interaction' or 'The Outback Travellers Track Guide' or 'outbacktravellers.com.au' or 'us' or 'we' refers to the owner of the website whose registered office is at Bundoora, Melbourne, Australia. Our business ABN number is 29 642 589 927 Melbourne, Australia. The term 'you' refers to the user or viewer of our website. The trademarks, names, logos and service marks (collectively “trademarks”) displayed on this website are registered trademarks of the website owner, excepting our display and usage of the trademarks for IMTA; Paypal and Facebook link. Nothing contained on this website should be construed as granting any license or right to use any trademark without the prior written permission of the website owner. The site owner reserves all of the site owners rights, including but not limited to any and all copyrights, trademarks, patents, trade secrets, and any other proprietary right that the site owner may have in respect of this web site, its content, and goods and services that may be provided. Goods and services of third parties may be advertised and/or may be made available on or through this web site. Representations made regarding products and services provided by third parties will be governed by the policies and representations made by these third parties. The site owner will not in any manner be liable for or responsible for any of your dealings or interaction with third parties. This website (outbacktravellers.com.au) includes links to other websites. These links are provided for your convenience to provide further information and does not imply endorsement by outbacktravellers.com.au of the site or any association operators. The linked sites are not under the control of outbacktravellers.com.au and we are not responsible for any linked site. Your use of this website (outbacktravellers.com.au) and any dispute arising out of such use of the website is subject to the laws of Australia. By using this web site or any service provided, you explicitly agree that:? (a) you will not provide any content or conduct yourself in any way that may be construed as: unlawful; illegal; threatening; harmful; abusive; harassing; stalking; tortious; defamatory; libelous; vulgar; obscene; offensive; objectionable; pornographic; designed to interfere with or disrupt the operation of this web site or any service provided; infected with a virus or other destructive or deleterious programming routine; giving rise to civil or criminal liability; or in violation of an applicable local, national or international law;? (b) you will not impersonate or misrepresent your association with any person or entity; you will not forge or otherwise seek to conceal or misrepresent the origin of any content provided by you;? (c) you will not collect or harvest any information about other users;? (d) you will not provide, and you will not use this web site to provide, any content or service in any commercial manner, or in any manner that would involve junk mail, spam, chain letters, pyramid schemes, or any other form of unauthorized advertising or commerce; you will not use this web site to promote or operate any service or content without the site editor's prior written consent; ? (e) you will not provide any content that may give rise to the site owner being held civilly or criminally liable, or that may be considered a violation of any local, national or international law, including -- but not limited to -- laws relating to copyrights, trademarks, patents, or trade secrets. This web site and the services provided to you on and via this web site are provided on an "AS IS" basis. You agree that the site owner reserves the right to modify or discontinue provision of this web site and its services, and to remove the data you provide, either temporarily or permanently, at any time, without notice and without any liability towards you, The site owner will not be held responsible or liable for timeliness, removal of information, failure to store information, inaccuracy of information, or improper delivery of information. Always use caution when giving out any personally identifying information about yourself or your children in any communication service. Design Interaction (outbacktravellers.com.au) does not control or endorse the content, messenger information found in any communication service and, therefore, Design Interaction (outbacktravellers.com.au) specifically disclaims any liability with regard to the communication services and any actions resulting from your participating communication service. Managers and hosts are not authorized Design Interaction (outbacktravellers.com.au) spokespersons and their views do not necessarily reflect those of Design Interaction (outbacktravellers.com.au). Once ordered books are sent to your indicated mailing address, via Australia Post, we are not responsible for any mishandling, damage, loss or time frames for delivery.